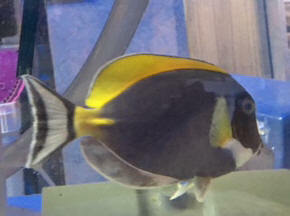 I purchased a rather small Powder Blue Tang, only about 3". I know that this size is generally not recommended, but he appeared alert, healthy and was eating. I paid for him and had the store hold him for three days prior to picking him up. Once home, he went in my 45 gallon quarantine tank. 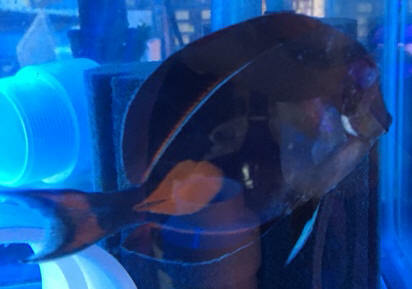 On day two he developed what appeared to be ick on his fins. I removed the carbon pads from my filter, and started treating with CopperSafe. He is still acting normally, nibbling at seaweed strips and small amounts of Mysis shrimp. Treatment started 48 hours ago. Water temp is 78, PH 8.2, salinity 32, spec grav 1.024, nitrates 10ppm.. I removed the carbon pads from my filter, and started treating with CopperSafe. He is still acting normally, nibbling at seaweed strips and small amounts of Mysis shrimp. Treatment started 48 hours ago. Water temp is 78, PH 8.2, salinity 32, spec grav 1.024, nitrates 10ppm. Is copper the wrong medicine to treat with? If so what do you recommend? How often and how much water should I change to control water quality? Will the two pieces of live rock in the tank have to be discarded after the treatment? How long does this usually take to run its course? until my 180 setup is ready for him, or move him to my existing 55 gallon FOWLR with a percula clown and 3" Heni butterfly fish? 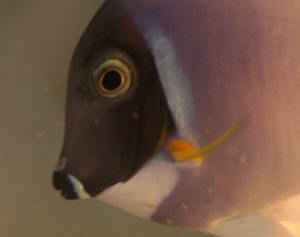 The 55 has been up and running for a few years with hermits, snails, coral banded shrimp and green Mithrax crab. Thank you for your help. Do you recommend isolation tank/ fresh water bath or what?? The owner of the LFS recommended against isolation tank because of the increased stress. <As above, and please read here.